A diamond may contain slight crystallisations called inclusions. To assess the purity of a diamond, it is necessary to study the number and position of inclusions within the stone. These are defects or accidents that occurred during the formation of a diamond within the Earth. They are due to contact with different materials or changes in temperature or pressure and explains their diversity. Various international standards have been established and, schematically, they are summarised as follows: “IF”, “VVS”, “VS”, “SI” and “P”. “IF” (Pure) : This class corresponds to the highest degree of purity. This means that in normal light when examined under a microscope, the diamond must be free of inclusions. “VVS” (Very Very Small Inclusions) : in this case there are very very small inclusions that are difficult to detect under a microscope. “VS” (Very Small Inclusions ) : this designation characterises stones containing very small inclusions that are difficult to see when enlarged 10 times. “SI” (Small Inclusions) : ) this is the next degree down in the scale of purity. 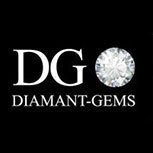 It applies to gems whose inclusions are small, but easy to see when enlarged 10 times. Included 1 : this category includes diamonds with inclusions, which although discernible, are barely visible to the naked eye when viewed through the crown. Included 2 : this category applies to diamonds with inclusions, that may be in large numbers or not but are relatively large, and visible to the naked eye through the crown. Included 3 : this category features all diamonds with large inclusions, that are easily spotted with the naked eye through the crown and in such quantity that they seriously affect the brilliance of the stone.